Infanticide, child marriage, bride burning, female genital mutilation. We care about these issues because we have empathy and compassion. Don't we? Sure, empathy is a Grade A reason to care about the suffering of others. But there's a deeper reason all people should care about inequality, a practical reason that requires no empathy. The above is my all-time favourite quote. Because until your very act of existence is qualification for your freedom, your freedom is not safe. Cultures change, borders move. What privilege you have today you may not have tomorrow. But you deserve equality and safety no matter your colour, gender or any other distinguishing characteristic. You deserve this because you think and you feel, and so does every other person on Earth. 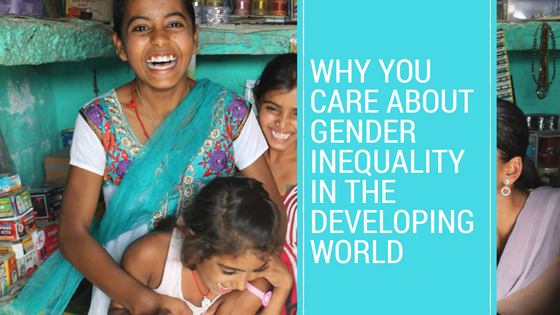 This is why gender inequality in India and across the world is inequality for all of us. From birth, women are oppressed. They are told they are lesser than, weaker than, stupider than. Then by denying education and treating them as second-class citizens, the prejudice self-perpetuates and women do become second-class citizens because their potential can never be reached and they remain dependent on their oppressors. We care about this maltreatment of each woman because we know better about the value of human beings. You know how important you are, therefore you know how important she is. You care about gender inequality in the developing world because the disrespect of one human is the disrespect of all. You care because human self-interest requires our selflessness. You care because you're instinctually designed to value and protect the future of your species. You care because until we all treat each other as equals, you may at any time face unequal treatment yourself.